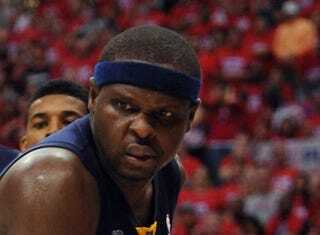 What Z-Bo supplies for the Grizzlies is obvious. He was their leading scorer during the regular season, is an elite offensive rebounder, and is the only rotation player on the team not named Tony who is, forget offensively or defensively, just regular ol' threatening. But of course that's probably why we're in this situation. He's also been their go-to man in overtime, which would count as a small sample in any other series, playing virtually every second of OT and posting almost 24 points per 36 minutes in those periods. As everyone knows, the Grizzlies' strengths may be only as good as Scott Brooks' weaknesses. Though he's improved this year and, at times, outmaneuvered Dave Joerger out of the breaks, the problems Randolph presents for the Thunder go beyond his proclivity to put the ball in the hoop. Most teams have issues with two big men who can pass out of the key and slash to the rim as easily as they can back up and post, but the Thunder are especially vulnerable to such combinations with their sluggish bigs generally wanting to stay near the basket. Randolph and Gasol play off of each other so well; the peaks and valleys in Gasol's offensive rating mirror Randolph's quite closely. But there are a few interesting threads that suggest the Grizz will still be feisty with their grit-n-grind big on the bench. Over at Basketball-Reference.com, you can check out Z-Bo's On/Off splits, a snapshot of how the Grizzlies perform while he's on the floor vs. how they do when he rides the pine. In the regular season, he's overwhelmingly a positive presence; but in the playoffs, it's been a different story. With Randolph on the floor, the Grizzlies are scoring at a rate that would keep them right near the bottom of the league. But when he's on the bench, their offensive rating is 110.5 (! ), a number that would lead the league by a decent amount. The defense numbers are all over the place, a sample size limitation I suspect, but in most aspects it is a measurable drop-off from the regular season numbers. Part of this is noise because a high volume player becomes even higher volume in the playoffs, and it's difficult to be high efficiency and high volume at the same time. But there's a lot of truth here. Nick Collison and Kendrick Perkins' weird Clifford the Big Red Dog routine aren't exactly the Thunder's version of Tony Allen, but they are strong guys with six fouls a piece who can body Randolph up and make him run through a car wash of big sweaty hands to get to the hoop. Seeing that, Joerger has gone small at times with Randolph (or Gasol) as the sole big in an effort to better space the floor. This can explain some of the drop-off in offensive rebounding percentage and so on, but no matter how you slice it: Randolph is working harder and less efficiently in this matchup than he has all year. And it is affecting the team. The Grizzlies top 3 5-man lineups in net points per 100 possessions feature just one of Gasol or Randolph, in part because Tony Allen's necessity makes a multiple guard lineup more attractive. But it's also because when Randolph comes in, the Thunder are, wouldn't you know it, adjusting. And they're winning. I think it would have been smart to see what the offense would look like without Randolph in certain advantageous situations (Perkins on the floor, etc) during Game 7, to try to goose the shooters a bit and counteract the bizarre free throw disparity. And it may still be smart, but unfortunately Randolph's hand has forced Joerger's. And so we'll see.